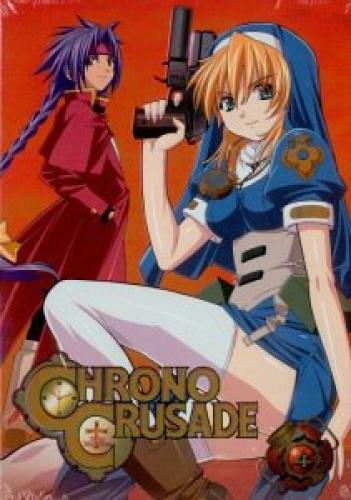 When will be Chrono Crusade next episode air date? Is Chrono Crusade renewed or cancelled? Where to countdown Chrono Crusade air dates? Is Chrono Crusade worth watching? It is after the Great War and the U.S. is experiencing an economic prosperity unlike anything ever seen before. However, all is not well, as the occurences of the ocult and devil-worshippers begin to sprout up all over the country. Enter the Magdalene Order, a special group of exorcist that use tradional methods (holy water and special metal) and infused them into the technology of the time to battle these demons and their summoners. This is the story of Rosette Christopher, a young exorcist and her close friend Chrono, a demon with a dark history, as they go on a quest to find and rescue Rosette's younger brother, Joshua, from the clutches of evil. This is going to be a trip! Chrono Crusade next episode air date provides TVMaze for you. EpisoDate.com is your TV show guide to Countdown Chrono Crusade Episode Air Dates and to stay in touch with Chrono Crusade next episode Air Date and your others favorite TV Shows. Add the shows you like to a "Watchlist" and let the site take it from there.